Cyber Monday shoppers are flocking to their computers and smartphones to take advantage of discounts at their favorite retailers. Retailers raked in record sales on Cyber Monday, as shoppers flocked to their computers and smartphones to grab online deals. Online sales soared 30% higher from Cyber Monday last year, according to IBM Digital Analytics Benchmark, which tracks more than one million e-commerce transactions per day from more than 500 retailers. "Cyber Monday was not only the pinnacle of the Thanksgiving shopping weekend but when the cash register closed it officially became the biggest online shopping day ever," said Jay Henderson, strategy director at IBM Smarter Commerce. The 30% increase eclipses both the 21% jump in online sales seen on Black Friday and the 17% increase on Thanksgiving day. It's also bigger than projections from data tracking firm ComScore, which put sales at $1.5 billion for Cyber Monday -- a 20% increase from the same day last year. A growing number of people used their mobile devices to make purchases this year. About 18% of shoppers checked out deals on their mobile devices on Monday, and 13% made purchases by phone or tablet -- up from 12% and 7%, respectively, last year. And while many retailers typically wait until the Monday following Black Friday to offer online-only deals, many began rolling out their online discounts on Thanksgiving or earlier this year. Online shopping traffic peaked at 11:25 a.m. ET on Monday, and department stores, health and beauty retailers, home goods sellers and apparel stores experienced the most sales growth, IBM found. 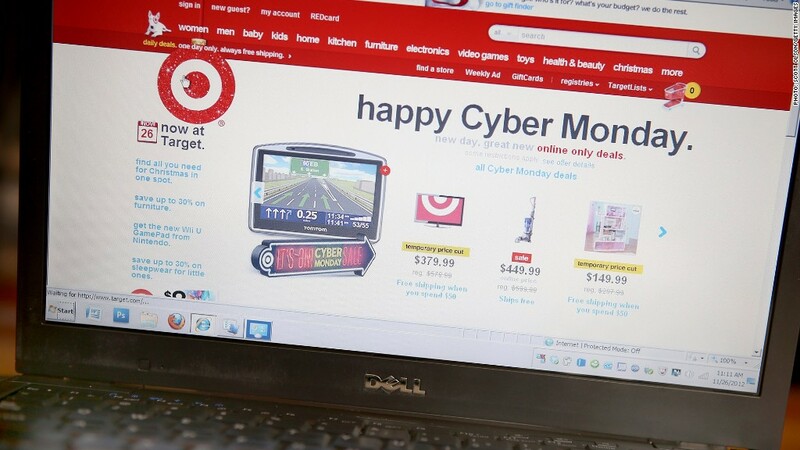 The individual retailers that were most-frequently searched for by users on Cyber Monday included Walmart (WMT), Best Buy (BBY), Amazon (AMZN), Sears (SHLD) and Target (TGT). The products that were searched for the most were Amazon's Kindle and Kindle Fire, Uggs, iPads, the iPod Touch, Legos and the Wii, according to Experian Marketing Services. This holiday season, online sales have widely outpaced in-store sales. Even on Black Friday, which is traditionally known for its in-store deals, online sales posted double-digit growth while retail sales at stores declined nearly 2%, according to ShopperTrak.